The Swiss voted over the weekend to automatically deport 'foreign' criminals. 'Foreign' is a category that in Switzerland nearly a quarter of the population, and a segment that is growing faster than the overall pop. Of course, the American experience with the same initiative has proven frightful, especially for those for whom 'home ' is a place they only know through their passport. 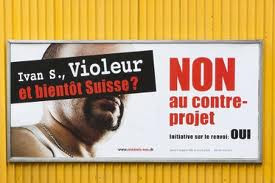 "The SVP, the largest political party in Switzerland, has decided to reintroduce divisive campaign placards that the party used during the 2007 elections. 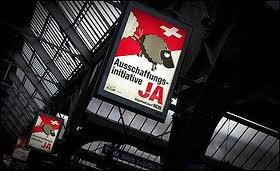 These depict a herd of snowy white sheep kicking a black sheep off a large red-and-white Swiss national flag. "Create Security" reads the slogan. The SVP posters were described by United Nations officials as "racist" when they were used in 2007. However the SVP has shown no qualms about using them again for its anti-foreign criminal campaign. Another SVP placard depicts a bearded man in a vest wearing a silver neck chain. "Faruk B is a murderer – should he be allowed to become a Swiss citizen?" asks a slogan underneath."